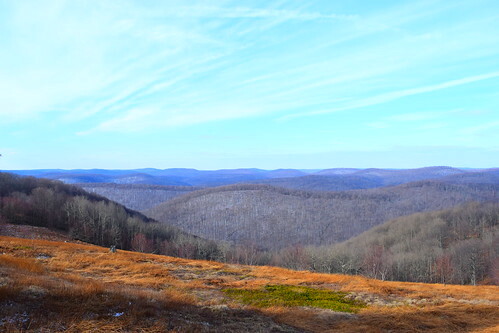 View over Schrader Creek Valley, SGL 36. 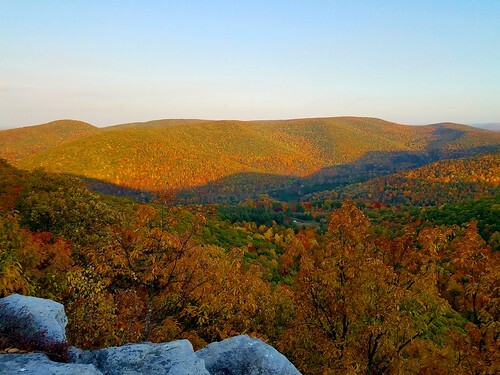 The Schrader Creek Valley is one of PA’s best kept secrets. 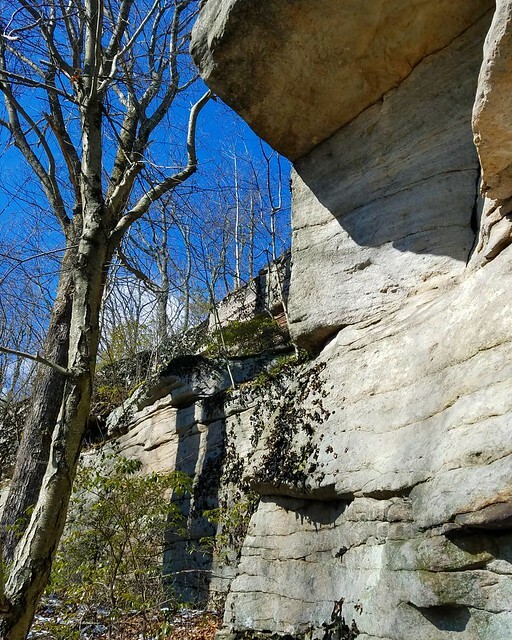 Here you will find towering waterfalls, gorges, huge rocks, Class III+ whitewater, ponds, rock climbing, vistas, and fascinating historical remnants from the coal and lumber eras. 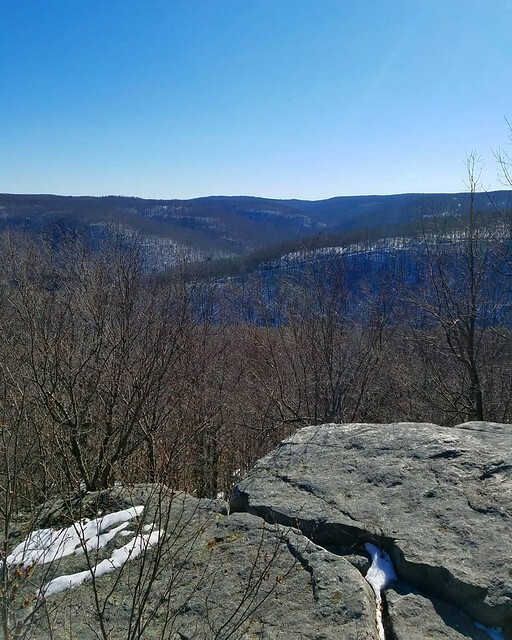 I recently went out to explore SGL 36 and find a vista overlooking the valley. I drove down Falls Creek Road and pulled off along the road (41.655855, -76.608576)before it became rutted and muddy. I then just walked down the road to a forest of pine trees, where I turned off the road followed a grade to the right (41.650738, -76.608228). This grade became a jeep or ATV trail as it followed the perimeter of a field with pine trees. In summer expect to see wildflowers. At the southern point of this field (41.645908, -76.611961), I followed a faint footpath that went southeast. This faint path went through laurel thickets and may be difficult to follow in summer as it is overgrown in places. This path is not blazed, but with some effort I was able to follow it through the laurel. The path went through open hardwoods, but then went through the laurel again, making a slight climb. I soon reached the edge of the plateau at some cliffs, where the path turned right (41.641404, -76.606739). 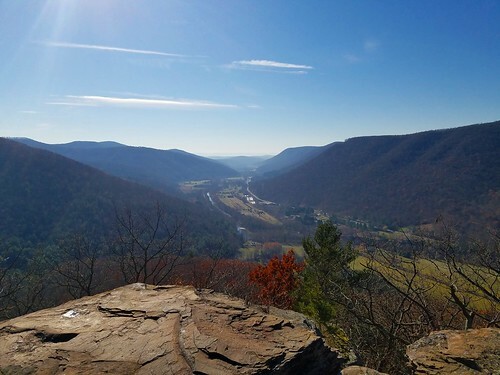 This dramatic cliff line featured tremendous views over the wooded, isolated Schrader Creek Valley. Some views were 180 degrees, offering views up and down the valley. 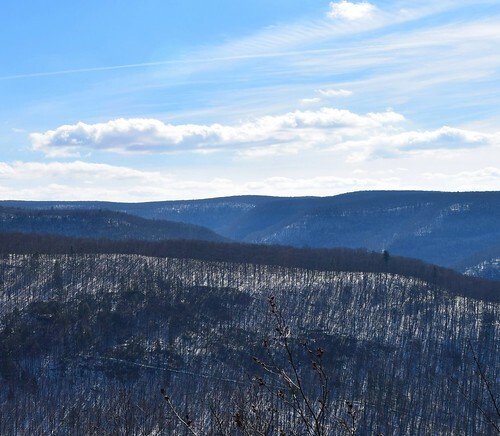 I enjoyed the rolling ridgelines and tiers of mountains between the glens and streams. 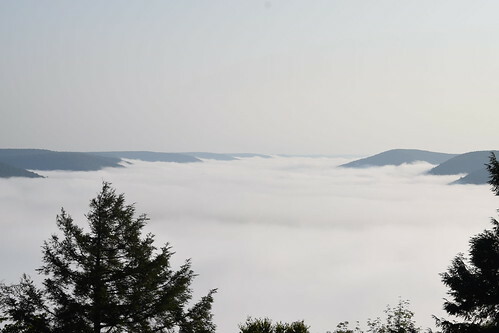 The view of the valley to the southwest was particularly beautiful. I could clearly hear the roar of Schrader Creek’s rapids from hundreds of feet below. I could also clearly see the incline plane that once transported coal from Barclay to the valley below. Be careful along the cliffs as a fall would be fatal. 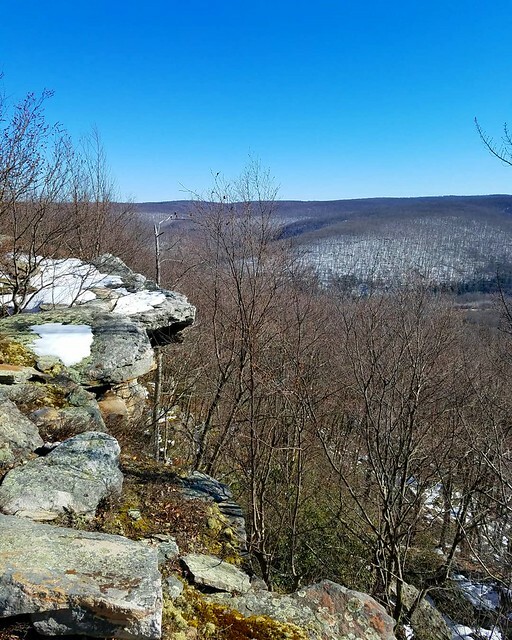 I continued west and went off any trail, exploring massive boulders below the cliffs and ledges. I went through an open hardwood forest with some giant oak trees and soon reached the mountain laurel again. I made my way through the laurel and soon reached another cliff line, with more views and overhangs (41.641693, -76.613212). This cliff line was just as impressive with chasms and excellent vistas from exposed ledges. I was surprised by the extent of the cliffs and the high number of views. Someday, I’d like to explore these cliffs from the bottom. I found a trail that was used and cleared by people, not bears, which made the hiking easier. This trail dropped down and then climbed up, following a series of small cairns. This trail was in much better shape than the one to the first cliff. This trail brought me back to the same field I had left earlier (41.645564, -76.616109). I walked the jeep/ATV trail back to Falls Creek Road and my car. 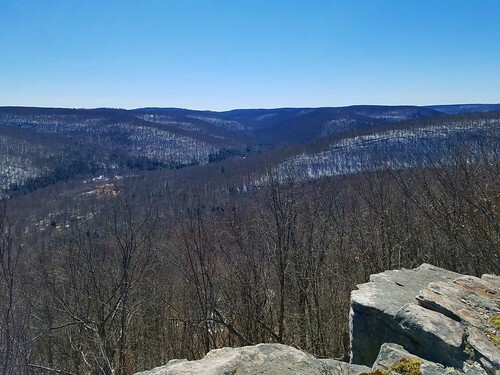 This is a truly beautiful hike with tremendous views. I was there in midday, so the bright sun washed out the features of the views. In the morning or evening I’m sure these views would be stunning. I hope to return in October for the autumn colors. I’m not sure if my route was the best. If I returned, I would follow the faint trail to the first cliff and vistas, retrace my steps, and then take the second trail to the second cliff line and vistas, and retrace my steps back to the field (the orange routes in the map below), avoiding the bushwhack in between. Yellow: Jeep/ATV trail along perimeter of field. Orange: Faint trails, not blazed or signed. The trail on the left is better established. I recently went out to explore the north rim of the Dry Run Gorge. It proved to be a beautiful hike. 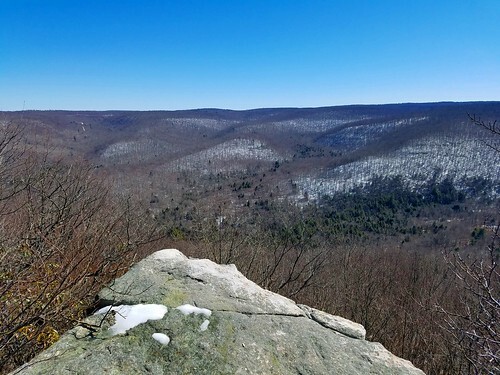 I parked at the Hillsgrove ranger/maintenance station and hiked up the red blazed High Knob Trail, which follows a gated, grassy forest road up the mountain. 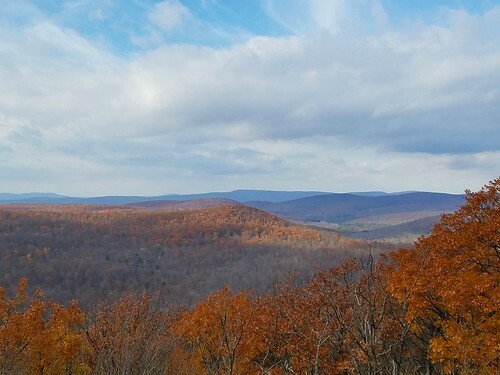 After hiking for almost a mile, I turned left and went off trail, hiking up to the ridge. I soon encountered large cliffs, overhangs, and ledges. I continued west, traversing the rugged terrain and angled boulders. I stayed at the base of these cliffs. I soon reached a remarkable spot of several gigantic boulders. 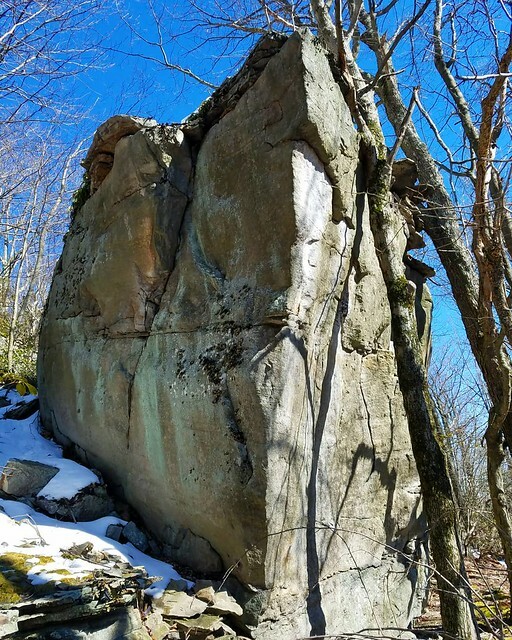 One was 75 feet long, angled slightly downhill, and the end looked like a bow of a ship hitting another huge boulder, so I called it Titanic Rock. Other house-sized boulders were nearby, looming through the forest. The cliffs only added to the fine scenery. 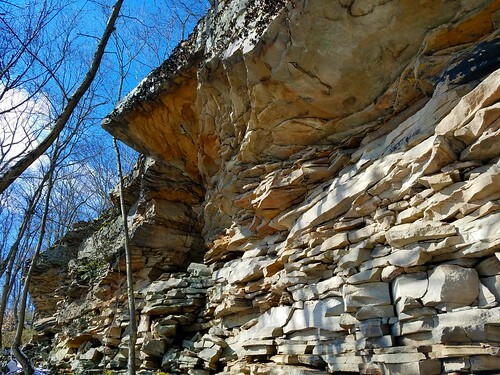 This looked like a good spot for rock climbing or bouldering. 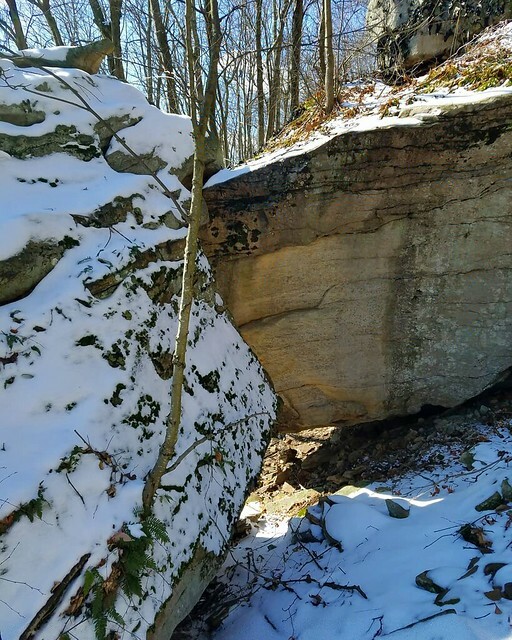 As I proceeded west, the boulders and ledges decreased in size. I then reached an open hardwood forest with some large trees and a small, spring fed stream. The laurel loomed ahead. Mountain laurel loves to grow along cliffs and its tangled jungles makes hiking tedious. I found some herd paths that allowed somewhat easy travel through openings in the laurel. I returned to the cliffs where I was now on top. 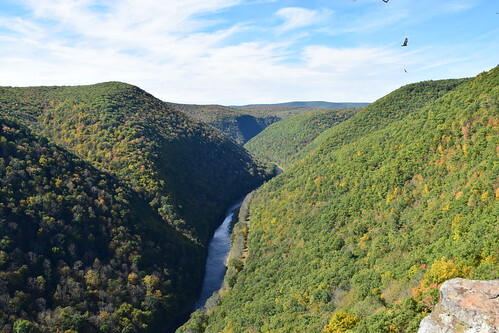 I followed a bear path, which are common along the tops of cliffs in the Loyalsock. I still had to deal with the laurel, but it was a little easier hiking. The large white pine trees made the forest scenic and aromatic. 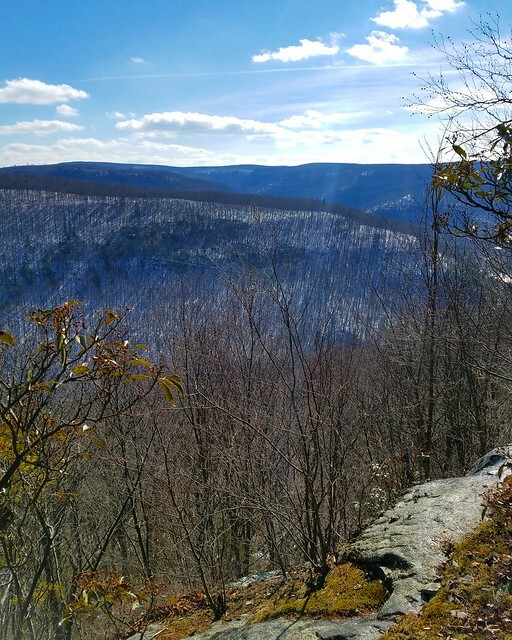 I then reached the top of cliffs with fine views across Dry Run Gorge and into Ogdonia Run, looking over tiers of ridges and canyons. 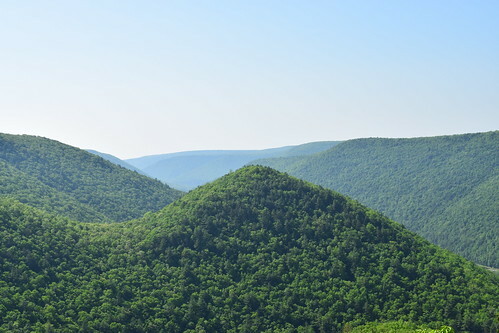 The distant canyon of Ogdonia Run had made side glens, creating tiers of descending ridges. It was a remarkable view with virtually no sign of development. Most surprising was how loud and clearly I could hear Dry Run flowing, despite being almost 1,000 feet above it. It was like I was sitting right next to the rushing stream. 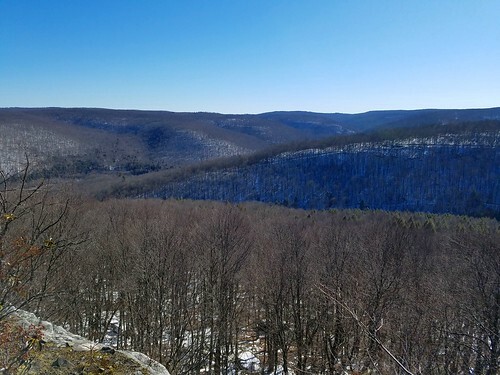 I continued along the ridge to the west and then to the north. There were more ledges and cliffs, but no more open views. I then made my way back to my car. 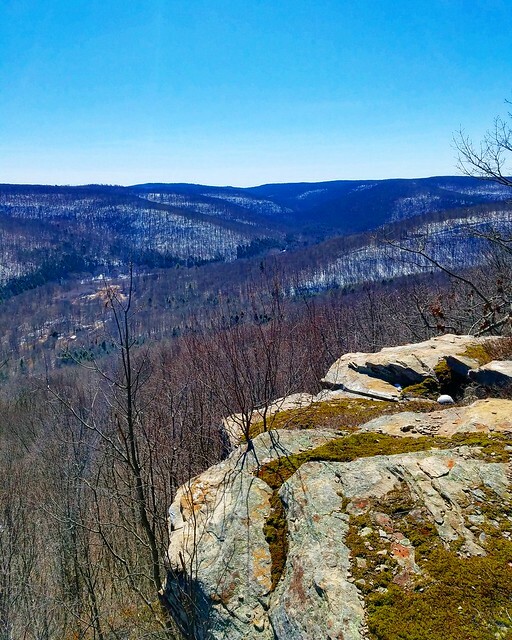 If you like vistas and huge rocks, this is the hike for you. 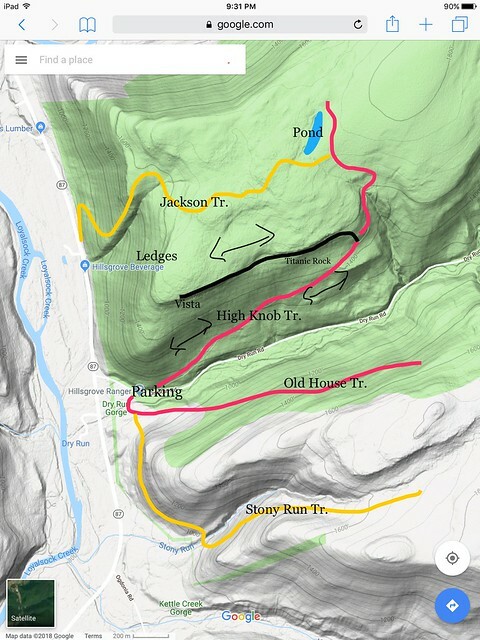 For the map above, the black route is the off trail route.